The Abram farm is situated on the Nanos plateau in a peaceful spot with a view of the Slovene and Italian coastlines, the Julian Alps, and the Dolomites. Visitors will also remember the farm for the fact that the Abrams use their own solar- and wind-powered generator built in 2003 to supply their electric power. 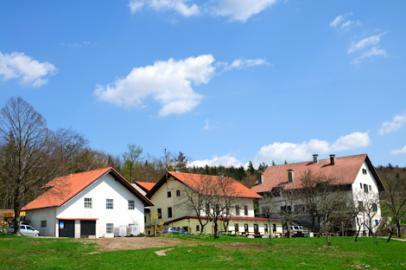 Activities on the farm are hiking, horseback riding, table tennis, bicycling, boules, children's playground.Enjoy traditionally prepared dishes from the Primorska region such as minestrone soup, jota, wild game, goulash, gnocchi, mushrooms, and various sweets to tempt the palate. Bring your children and let them learn about farm and forest animals. Activities in the area are skiing, cross-country skiing, swimming in river / lake, paragliding, hang-gliding, fishing.